A woman has struck gold after finding a 22 carat coin dating to the reign of Henry VIII. Louisa Bottomley, from Overton on the Shropshire/Wales border, found the coin in a field in Suffolk during a metal detecting weekend with her partner. It was the first time she had ever used a metal detector and said she could not believe her luck. The couple said they were planning to keep the shilling - valued at up to £2,000 - as a family heirloom. 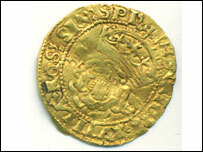 The coin was discovered in a field in Great Bealings, near Woodbridge, Suffolk on 24 February. It has not been professionally valued but reference books show it is a Crown of the Double Rose dating to between 1509 and 1547 when Henry VIII was married to Katherine of Aragon. One book estimates it could be worth as much as £2,000.